Unique new design magnet grid on Rotary plate enabling attraction of difficult to clean iron particles. High power efficient Rotary grid for sticky diary products. Cleaning done by swinging out the rotary magnet plate outside and manual cleaning. 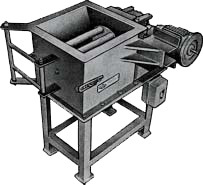 Materials fed by conveyor or manually. Made with Rare Earth NdFeB magnets. Suitable for sticky diary products/pulverised minerals, fibrous substance, lino and fine cohesive materials like magnesium oxide, zircon powder, fly ash, alumina, gypsum etc. Rotary action prevents materials from bridging for better exposure to magnet for attraction.